Hunger striker Bobby Sands has died in prison 66 days after first refusing to eat. The 27-year-old republican spent the last days of his life on a water bed to protect his fragile bones. He had been in a coma for 48 hours before being pronounced dead by medical staff at the Maze prison in Northern Ireland. Humphrey Atkins, Secretary for State for Northern Ireland. Sands’ parents, brother and sister were at his bedside when he died. 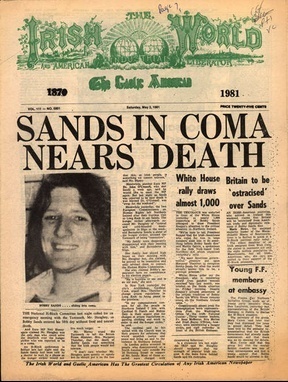 This was the second time Sands had been on hunger strike, the first was in 1980 when a number of prisoners in the Maze prison were demanding political status for republican prisoners. Mr Humphrey Atkins, Secretary of State for Northern Ireland issued a statement shortly after the death. He said: “I regret this needless and pointless death. “Too many have died by violence in Northern Ireland. In this case it was self-inflicted. “We should not forget the many others who have died. Three other republican prisoners at the Maze prison remain on hunger strike. There is grave concern for 25-year-old convicted murderer Francis Hughes, who began his strike 15 days after Sands. Bobby Sands, who had served five years of a 14-year sentence for possessing a gun, began his hunger strike on 1 March. He had softened his stance since the first strike and this time was making five main demands: that republican prisoners be allowed to wear their own clothes, that they be given free association time, visits and mail, that they should not to have to carry out penal work and should be given back lost remission. 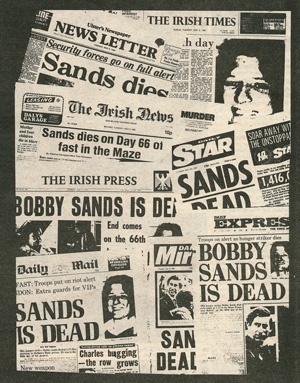 The Provisional IRA is now expected to launch a campaign of violence and destruction in response to Sands’ death. Bobby Sands mother says that she will not force him to be fed. Rioting ensues after the death.